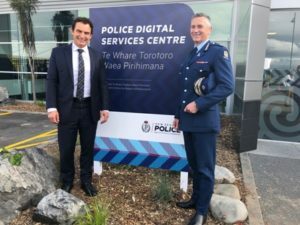 Police Minister Stuart Nash has opened the new Police Communications Centre, Te Whare Torotoro Waea Pirihama, in Paraparaumu. It will eventually house over 200 staff. Police say the national digital services and communications centre in Ihakara street will help transform the way Police connect with the public, and make communities safer. Minister Nash says: “The new digital services and communications centre is much more than just a major new Police building,” said Mr Nash. “The specialist services made possible by this new facility signal a transformation in the way Police connect with the public. Minister Nash and Commissioner Bush inside the refurbished building. He says the online crime reports cover all the questions a Police officer would ask and will be managed by a dedicated digital team at the Kapiti centre. Police will monitor feedback on the online trial and make improvements if needed. The trial will initially focus on lost property and property damage such as vandalism, which account for over 78,000 reports to Police each year. Online reporting will not only make it easier to report a crime or other issues, it could also reduce the inappropriate use of channels such as the emergency 111 number. The Minister also says: “Police are working on a single non-emergency number to minimise inappropriate use of the 111 service. This is planned to go live in 2019. “A virtual service point is being piloted where a digital portal connects the public to a Police staff member. Of 150 front counters that were closed due to health and safety or accessibility problems, 82 have been refurbished and reopened and upgrades are underway to the remaining 68 sites. 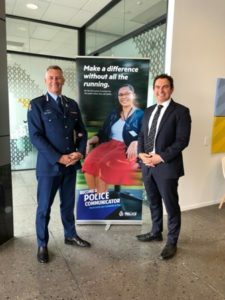 “The Coalition Agreement with New Zealand First commits the government to strive for 1800 extra Police over three years. “Frontline Police numbers have grown by around 450 above our June 2017 baseline, through a combination of strong Police recruitment, deployment of 941 new constables, and low attrition. We have more work to do to lift Police numbers and improve public services, but we are making good progress as we build safer and more connected communities,” Mr Nash says.